In order to get the most accurate mentions that you can work with, you need to narrow down and tailor the keywords to monitor in social media. People are talking about your business online, whether with positive, negative or neutral sentiments. By monitoring your brand name with social media monitoring tools, you can reach out to those who have mentioned you and, in case of something negative, protect your reputation and respond to criticism at the right time. By monitoring these brand name keywords with a social monitoring tool, you will be able to quickly react to online comments and mentions once they appear. Not only will you impress your client, but you will be able to better understand what things are not working for your business. Also, remember to exclude some irrelevant keywords if your brand name is a common word. In order to understand when your audience is struggling with something that you can help them with, you need to monitor phrases that have at least two keywords that describe their problem. These keywords can help your business look proactive with current customers and they can help you with customer acquisition by solving potential clients' problems. If for instance you are an Ecommerce platform selling prom dresses, you can start monitoring queries that contain different types of keywords like required and main (optional). A main keyword would have to contain the word “prom dress.” This means that any result which appears in your social media monitoring tool will have to contain the keyword "prom dress." Then, you can add optional keywords to get a more precise result, e.g. "find," "buy," or "where." At least one of those optional keywords will have to appear with the main keyword, but all three do not have to appear together. Once you setup your first topic of monitoring potential problems, you should start seeing a flow of mentions coming in! Now you can begin to step in and react. You don’t have to give them the solution of offering your product right away. You can simply suggest a solution that will be beneficial without seeming to coercive. This way, people that take part in the discussion will remember you well, which can increase your authority as an expert in the field. You may want to further narrow down your results to be able to do better outreach. For instance, if your Ecommerce prom dress shop only sells to the east coast of the US, you may want to add optional keywords, e.g. New York, Boston, etc. and exclude other keywords, e.g. L.A., California, Arizona, etc. Even then, you may see an influx of results that are not related and you will want to better refine your data. Unamo Social Media lets you decide how many words after the main keyword would you like the main (optional) keywords to fall. Therefore, when you get a blog article talking about prom dresses in LA that, much later in the article, mentions a bakery the blogger ate at in New York 6 month ago, you will not get that as a relevant result. To refine your data and limit the number of words the optional keyword is from the main keyword, use the forward slash symbol ( /). This means the example "I'm ready to find a prom dress" will be include since find is located within three words of the main keyword. 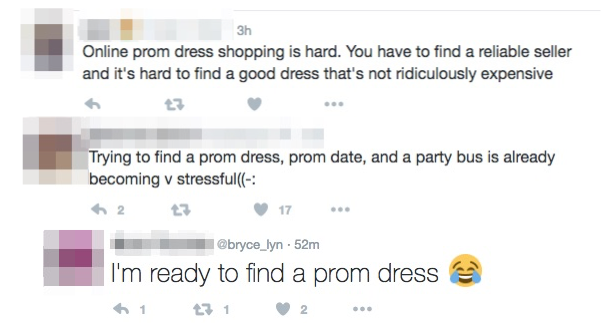 However, the mention "Online prom dress shopping is hard. You have to find a reliable seller and it's hard to find a good dress that's not ridiculously expensive" would not be included since the optional keyword "find" is not within 3 words of the main keyword. At Unamo, we suggest you do not do more than /3 when using this feature, as your results will not be as tailored. Next, you may want to see results that include many variations of the same word. The best way to do this in Unamo Social Media is by adding the asterisk next to the keyword. Due to the backslash and asterisk, this will include results like: "I looked for a prom dress all day" or "I am looking for my prom dress online, but having no luck!" However, if the word look* is more than 3 words away from the main keyword, it will not appear as a result in you social media monitoring data. If you want to jump into a conversation about a specific type of product, you can easily do it by monitoring the products that you offer. This way you can hopefully understand why your clients are looking for products like yours and what matters to them the most. What’s even more important, though, is that you’ll be able to reach out to current and new clients, and offer them solutions and advice! You should be monitoring different types of products you’re offering. You will, however, benefit a lot also from monitoring those products that are mentioned along with your competitor’s brand. For instance, if somebody is looking for an opinion on a specific product under your competitor's brand and you’re offering the same type of product but slightly better, there’s no better way to attract a client than by reaching out once such a comment appears. All you have to do is monitor your competitor’s brand (main keyword) and the product you’re both offering (required keyword). Another thing to consider is monitoring mentions of events that your competitor is taking part in. By doing that, you will know what events they find valuable and in which direction they’re going. Of course, what you can also do is monitor just your competitor's brand (main keyword: “brand name” or “brandname”) in order to be up to date with everything they’re up to. Also, remember to exclude some irrelevant keywords if your competitor’s name is a common word. You may want to reach out to people who tweet or share something that at a first glance may seem unrelated to your business. If a woman, however, is tweeting Marilyn Monroe’s quote: “A smile is the best makeup a girl could wear”, there are some brands or business that can take action and react to gain exposure and potential clients. All it took was the keyword “make-up”. Try it yourself! Finding the types of keywords you would like to monitor is a process, but you can have fun with it and learn about your customers along the way. Required keywords - At least one of keywords must appear with the main keyword. Excluded keywords - If at least one of these keywords appears in the result, we will not show it in Unamo Social Media results. The / can be used to limit the number of words the optional keyword is from the main keyword. The * can be used to get all written suffix variations of a keyword.